[ ! ] Dangling Thoughts: Sir, I am not a child labor! 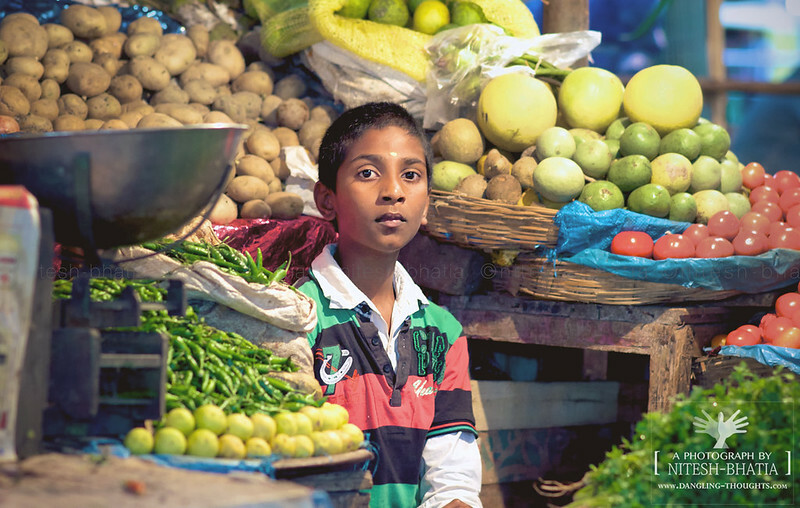 Roaming around a vegetable market in Bangalore, he caught my attention and I took this photo. Afterwards, I showed him his picture and to my surprise he was a bit frightened. With a hesitating tone, he said in english, "Sir, this picture will not come in newspaper naa? I am not a child labour. My mom sits here and she has gone somewhere around that's why I am attending the store". Recently schools have started teaching young kids about importance of education and ill effects of child labor in India. This somewhat has started new wave among kids as they themselves become aware of what is right and wrong. But anyways, I enjoyed a two lined conversation between me and him. And yes he was not a child labor. I met his mom afterwards. Massive post. Really good-looking blog. A lot of blogs, I observe these days don't really present anything that I'm interested in go to .but I'm most definitely interest in this one. I am in reality happy with article quality and direction. This post is mark on in helpful how some thought apply to any script point. Thanks a lot for protection enormous things. I am enormously a good deal thankful used designed for this place.